Elevate your cookery to the heights of professionalism, with the most beautiful, practical and clever kitchenware around. It’s Chef Inox! In case you don’t know, ‘inox’ is the French term denoting stainless steel, which in French is quite a mouthful – “acier inoxydable”. And each Chef Inox product is not only made from quality stainless steel, it’s made with home chefs in mind and is designed to achieve professional results with ease. Lumpy gravy? Soggy pasta? Unsifted flour? Blech! Some things are just unacceptable when cooking! Strain your way to smooth gravy, al dente pasta, and the fluffiest scone mix ever, with a handy Mesh Strainer. We’ve given you three ways to use it…but there’s probably a hundred more! Encompassing many kitchenware staples, you can be sure that a Chef Inox kitchen is a kitchen worth cooking in. 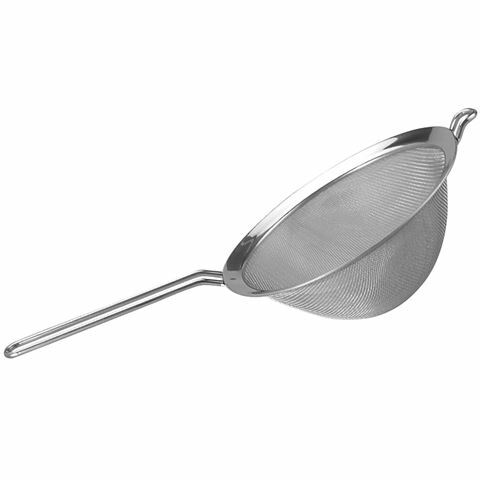 Quality solid construction, and a fine yet tough mesh to handle all your straining tasks. Dimensions: 23.5cm (l) x 10.5cm (w).